Product #60784 | SKU 996369005 | 0.0 (no ratings yet) Thanks for your rating! 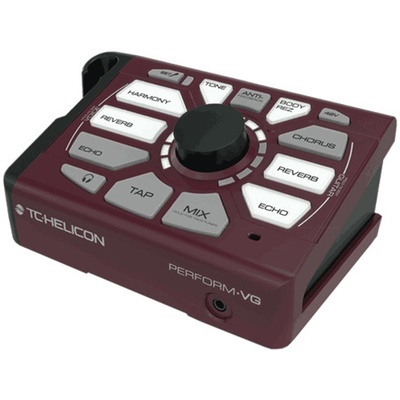 The TC-Helicon Perform-VG is a compact vocal processor designed to provide multiple harmonies and versatile tone enhancement for singers who either play acoustic guitar or perform with an acoustic guitarist. It features real-time pitch correction and can create up to two harmony voices by tracking the chords played on your guitar. It offers XLR and 1/4" inputs and outputs, a low-noise microphone preamp, and selectable phantom power. Multiple vocal and guitar effects include reverb, echo, chorus, and more. The Adaptive Tone function applies compression, de-essing, and gating to your sound for simple and effective dynamics processing. Activate the Anti-Feedback option to prevent vibe-killing screeches of feedback. Adjust your levels and effects at any time via the large, easy-to-see, front-panel controls, or use optional footswitches and microphones to access effects. The Perform-VG can be positioned on the floor or mounted on a mic stand for improved convenience.